Google reports 37 countries exceeding 5% of traffic, with new countries being added weekly. Akamai reports 7 countries whose IPv6 traffic exceeds 15%. In Japan, all three major mobile networks, NTT, KDDI, and Softbank, are deploying IPv6 this year, and in India, Reliance JIO’s deployment has driven measures of IPv6 traffic in the country to exceed 20%. The IPv4 Market Group comments that it expects IPv6 user count to exceed 50% world-wide in 2019, and with that, the start of the decline of the IPv4 address market. IPv6 has been a “future” since 1998, and an important future since 2007. It is now becoming a present-day reality. This document is intended for CIOs considering deployment of IPv6 in their networks, and those who make reports for them. There is an abundance of data regarding the ongoing IPv6 deployment, but it is not all in one place. In this report, the Internet Society hopes to pull the fundamental conclusions together and refer interested readers to more detailed analyses. Plus, anything else that the session might transit. That is a lot to get right, and today, generally the only thing preventing connectivity is the user or server network. We describe current mythology regarding IPv6, and the realities of deployment. Mobile networks are driven in part by cost; the provider pays for IPv4 and IPv6 Access Point Names (APNs) separately. Hence, they find it in their interest to use one or the other, but not both. Many mobile networks are taking the step to run IPv6-only where they can, and report that 70-95% of their traffic becomes IPv6 when they do. ISPs and content providers are driven by the complexity of their operations, and find innovation opportunities and complexity cost reductions stemming from IPv6 deployment. In the Internet of Things, a variety of connectivity solutions are used. However, ZigBee Secure Energy Profile 2.0, the OpenThread Group, the Open Connectivity Foundation (formerly the Open Interconnect Consortium), and other IoT consortia are standardizing on IPv6 or its IEEE 802.15.4 variant 6LowPAN. Google, APNIC, and Akamai report various traffic measurements; at this point, Google reports that traffic to their data centers from 37 nations is at least 5% IPv6, and in several cases, one third to one half. In sections 4 and 5 we draw conclusions and make recommendations. A key point is that IPv6 has now emerged from the “Innovators” and “Early Adoption” stages of deployment, and is moving into the “Early Majority”. The price of an IPv4 address is near its projected 2018 peak, and cloud hosting providers are starting to charge for IPv4 addresses while leaving IPv6 services free from additional charges for address space. Increasingly, IPv4 is an unnecessary cost, and a speculative asset. An IT department or CIO that is faced with purchasing IPv4 addresses has reason to ask whether the expense is worth the value. The short answer is that it increasingly is not. Even if it is not making that decision, the company would do better, in the long term, to sell the address space it has and use the money to fund IPv6 deployment, connecting to an upstream ISP that will use NAT64 to connect to remaining IPv4-only content. Given the decision to deploy and use IPv6, the CIO is faced with the reality that his or her equipment and software may not yet support it. An audit is required to determine the impact of that, and a budget decision and technical project to correct it. As a result, the best time to start that process is now. The Internet Engineering Task Force (IETF) has designed, and many companies are deploying, a next-generation protocol to replace the original Internet Protocol, IPv4. This is IPv6. The research for this report was done in March-April 2017. It cites several websites that track deployment progress, which by nature changes daily. Hence, numbers reported by those sites on a given day may differ from those documented in this report. • The initial concepts behind Network Address Translation (NAT) were developed. At that time, the probable impact of each strategy was unknown, although in retrospect we can say that NAT has extended the life of the IPv4 Internet by at least twenty years, although even that couldn’t prevent eventual address space exhaustion. IPv6 was proposed jointly by Bob Hinden and Steve Deering, and the current specification published in 1998. Related work, such as the development of DHCPv6 (for host configuration), the AAAA DNS resource record (mapping IPv6 addresses to names), modification of the TCP and UDP pseudoheaders, and other related-and-important changes, plus the development of the Kame IPv6 stack for OpenBSD and implementation in Linux, MacOS, Windows, and other common operating systems, went on over the next ten years. ICANN ratified a policy for IPv6 prefix allocation in 2006, and in 2007, Japan’s national Network Information Center (JPNIC) issued a report indicating the industry prognostications on IPv4 runout and IPv6 deployment made mathematical and economic sense, and called for action. By 2009, over 300 ARIN members had been allocated IPv6 prefixes for testing and early deployment. The Internet Assigned Number Authority (IANA) ran out of IPv4 address space in January 2011, and the RIR for the Asia Pacific region, APNIC, ran out in April, two months later. The RIRs, of which there are currently five (ARIN, RIPE NCC, APNIC, LACNIC, and AfriNIC), have now each run out of IPv4 address space, and retain space only for allocation to new market entrants. Predictably, actual use of IPv6 waited until the IPv4 run-out had occured. At this writing, Google reports 37 countries using IPv6 for 5% or more of their interactions with them. APNIC and Akamai report similar numbers of countries accessing their services using IPv6 with the top 10 countries having over 22% of user traffic on IPv6. The IPv6 protocol is now stable and widely deployed. A common myth is that IPv6 is not backward compatible with IPv4. This is only partially true; there is a defined format for an IPv6 address containing an embedded IPv4 address, specifically to enable backward compatibility through translation. However, IPv4 isn’t forward-compatible with anything; if it had a variable length address, operators could have extended the address rather than having the IETF define a new protocol, and network address translation would never have been a question. Whatever one’s opinion of IPv6, the fault is with IPv4. Another common myth is that “Nobody is using IPv6”, that it was finished in 1998, stayed on the shelf for 18 years, and that deployment progress is stalled. The base specification was indeed finished in 1998; supporting work in DHCP, DNS, TCP, UDP, and other protocols, plus vendor implementation, took another ten years, and were primarily tested in national research and engineering networks (NRENs) and universities. Commercial deployment impetus came with the exhaustion of the IPv4 address space starting in 2011. The fact is that numerous companies (23% of Autonomous Systems worldwide) have deployed it, and some are turning native IPv4 off within their networks. Notably, the North American IPv6 Forum recently honored twelve companies, AT&T, Charter, Comcast, Cox Communications, Google Fiber, Hughes Net, Midco, Rogers (Canada), Sprint, TELUS (Canada), T-Mobile, and Verizon, for their deployment efforts. This is becoming true worldwide. JPNE in Japan has deployed IPv6 natively with a MAP-E overlay for IPv4, which multiplexes customer router “outside” IPv4 address use by borrowing bits from the TDP or UDP port number, and then carries it across an IPv6-only network to a border relay. Using native IPv6 in its LTE network, Reliance JIO in India carries 70% of India’s IPv6 traffic, single-handedly bumping the country’s IPv6 utilization to 20% of all traffic. Deutsche Telekom in Europe reports that 35% of their users have access. Telefonica Peru deployed in 2013 and as a result, Peru is a leading country in IPv6 deployment globally. And the list goes on. The reasons given for IPv6 deployment vary, but (in T-Mobile’s words) often come down to “save money and make the network simple”. This requires a willingness on the company’s part to think further ahead than the next quarter, and to invest in the short term to reduce capital and operational costs long term. Doing so avoids IPv4 APN costs for mobile carriers, and the cost of purchasing IPv4 address space for any network. Having a common flat address space also simplifies operations. Reliance JIO, in India, started deploying IPv6 after its RIR ran out of IPv4 address space. APNIC, following its allocation guidelines, allocated 1024 IPv4 addresses and an IPv6 allocation containing eight times as many LAN-sized IPv6 prefixes as the entire IPv4 space has addresses – more than 34 billion /64 prefixes, each of which contain 264 individual addresses. Note that India is the world’s second-most populous country, with roughly 1/5 of the global population. Reliance has been forced to purchase IPv4 address space as a result, but for business reasons prefers not to. As of February 2017, Reliance reports that about 90% of its LTE customers are using IPv6, and represent about 80% of their traffic. This is driven, they say, by their principal content partners, Google, Akamai, and Facebook, who deliver their content only using IPv6 in that network. 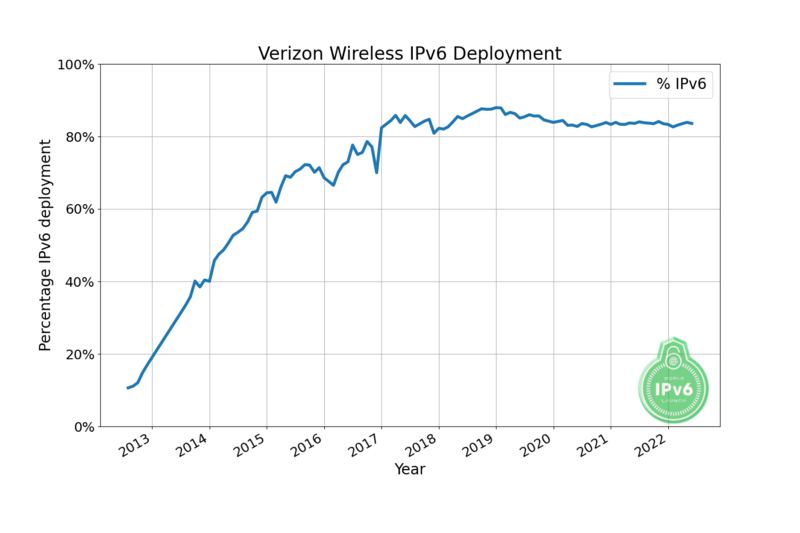 Verizon Wireless proactively deployed IPv6 even though they had an existing IPv4 network. Per reports, they had at least 70 internal instances of the same private address space, and found themselves spending effort and money on the resulting network complexity; IPv6 deployment was a solution that simplified their network and reduced the cost of operating it. Google now reports that about 90% of traffic from Verizon Wireless to them uses IPv6. T-Mobile is similarly in the process of turning IPv4 off within their mobile network, operating IPv6-only. Facebook reports that they are in the process of turning IPv4 off within their data centers; IPv4 and IPv6 from outside comes to their load balancers, and behind them it is only IPv6. The effect has been operational improvements and innovation in their software. Other companies, including LinkedIn and Microsoft, have similarly stated an intention to turn IPv4 off within their networks. Universities have also been early deployment test locations and early adopters. Virginia Tech, for example, deployed IPv6 in a trial location in 2004, and then expanded it throughout their campus system. In 2016, they reported that 82% of their traffic volume used IPv6. Similarly, Imperial College London reports that they started experimenting in 2003, secured commercial service in 2010, and in 2016 had SLAs for IPv6 service equivalent to their IPv4 service – averaging 20-40% of their traffic. Interestingly, they report that a significant proportion of their highenergy physics collaborations, such as with CERN, depend on IPv6. A dynamic readily observed in traffic measurements is that the demand for IPv6 service appears to be low until it is turned on, and then spikes as applications discover its availability. This confirms the readiness of operating systems and applications for IPv6. While there are cases in which IPv6 service predated IPv6 demand, and traffic grew over time44, when an operator (such as Swisscom, New Zealand Telecom, or Reliance JIO in India) enables IPv6 in their network, they usually find significant demand (e.g., hosts will use it), resulting in a spike in their IPv6 usage statistics. Three companies that publish their measurements of IPv6 traffic are Google, Akamai, and APNIC. Each is capable of talking about traffic that comes its way; however, the methodologies differ. Google looks at search engine and cache results. Akamai looks at TCP sessions terminated at its servers, which is similar and related, but different. APNIC inserts web objects into online ads. These objects have domain names that trigger different IPv4 and IPv6 behaviors; by observing the requests to their measurement infrastructure, they can calculate the difference between IPv4 and IPv6 behavior, and IPv4/IPv6 preference. Different methodologies inevitably produce different results, although it is possible to discern clear trends when individual networks start enabling IPv6 for their customers, or when IPv6 use starts to become widespread in a particular country or geographic region. Amazon publishes a list of what it considers to be the “Top Million Sites”, known as the “Alexa” rankings. Hurricane Electric’s analysis of these names indicates that of those million sites, 134,354 (13.4%) offer an IPv6 address in a AAAA record, and of those, 27,727 offer only a AAAA record. Of the 134,354 sites, 97.001% can be connected to using IPv6 (e.g., have valid IPv6 addresses and accept an http or https connection) to the listed name. As noted by Hurricane Electric, some of those sites have a special name (such as ipv6.example. com); they are in addition to the 97%. It would be easy to dismiss these sites as companies “kicking the tires” of IPv6, and for those with IPv6-specific names it probably is. However, companies offering both A and AAAA records in their primary names (or referring access to them) are expecting both. What this suggests is that about one in eight names is inviting IPv6 access. For the top 1000 websites, the percentage is higher, in excess of 20% or one in five. The growing popularity of IPv6-capable hosting providers such as Cloudflare, Akamai, AWS, or others is helping to drive up the availability of IPv6-capable web content. Cloud providers help web content providers ensure the availability and performance of their service, and the IPv6 capability is a bonus. Some network operators have published data that allows one to see how their measurements compare with measurements from the outside. For example, in 2014, Swisscom commented that 35% of their customers were IPv6-capable, and that 8.5% of their peak traffic was IPv6. Externally, Google and APNIC said that about 10% of the traffic to them from Switzerland (and therefore Swisscom) used IPv654. In mid-2015, Swisscom reported that 76% of their users were IPv6-capable and 20% of their traffic used IPv6; Google reported 20-25% of Swiss traffic using IPv6, and APNIC reported 25-30%. One can conclude that internal and external measurements agreed within a margin of error. Similarly, in the UK, Sky reported in October 2016 that at least 20% of its traffic was IPv6, and EE reported that 50% of dual-stacked subscriber traffic used IPv6. Google, by comparison, reported total UK IPv6 traffic they observed to be about 15%, APNIC reported about 22%, and Akamai reported about 11%. APNIC and Akamai report similar numbers of countries accessing their services using IPv6. As noted in §2.4, APNIC measures capability and preference by using Google advertisements containing links to IPv4-only, IPv6-only, and dual stack names; they can determine from the name lookup and the content lookup what a correspondent is capable of and what it prefers. APNIC measurements of continental IPv6 traffic as a percentage of total traffic. There are large parts of the world in which IPv6 is not dominant. Interestingly, large parts of the world are not well served using IPv4 either, and APNIC’s comparison of IPv4 and IPv6 RTT suggests that IPv6 would serve them as well or better. The DNS is a critical component of IPv6 deployment and adoption; for two systems to open a session and communicate, one needs to determine the address of the other, and this is done by querying the DNS. The DNS is a hierarchical system; resolving a name such as www.example.com requires queries to find servers for .com, .example.com, and www.example.com in that order (although the search can be reduced by caching). The services that respond to those queries are referred to as the DNS Root, Top Level Domains, Second Level Domains, and services within the Second Level Domains, respectively. In the root domain, which is to say the service that provides the addresses for TLDs such as .com, .org, .us, or .io, we have twelve companies operating thirteen identities (Verisign operates two). Each of these identities is dual stacked; it has both IPv6 and IPv4 addresses. There are 1530 TLDs, of which 98.2% (1502) have IPv6 name server addresses and can be queried using either IPv4 or IPv6; an ICANN requirement of all new TLDs is that they be IPv6-capable the day they launch. In total, across the TLDs, we have 9,510,719 registered domains with AAAA records. Most widely-deployed resolvers can communicate using IPv6, and all can deliver AAAA records. However, services vary. For example, OpenDNS at this point does not have an IPv6 address, although it can serve AAAA records, while Google’s Public DNS and Amazon’s Route53 are accessible using either IPv4 or IPv6. The discrepancy between requests in and responses out likely has to do with the handling of incorrect or malicious requests. However, DNS clients use IPv6 for approximately 11% of requests seen at F Root (one of the 13 Internet root name servers known as A-root through M-root. F-Root is operated by ISC) coming from about 7.8% of identifiable clients. LACNIC has studied the use of Network Address Translation (NAT) in its region. In IPv4 networks, they report that the vast majority of clients (94%) are behind NATs. That is unusual in IPv6 networks; only 0.6% are behind IPv6/IPv6 NATs, and NPTv6 appears not to be in use. It seems probable that the operational complexity of handling multiple layers of NAT will not be a feature of IPv6 networks in future. In addition, the Chinese Educational and Research Network CERNET has an IPv4-only and an IPv6-only network, and uses stateless translation between them. Similarly, T-Mobile USA, Softbank, and other companies deploy IPv6-only service to handsets, and use IPv4/IPv6 translation to facilitate access to IPv4-only sites. IPv6 routing is supported in all major protocols today, including BGP, OSPFv3, IS-IS, and Cisco’s EIGRP. There exist 57,400 Autonomous Systems advertised in the global BGP routing database, as seen by Hurricane Electric. Of these, 13,265 (23.1%) advertise an IPv6 prefix in BGP, and 12,945 advertise both IPv4 and IPv6 prefixes. 44,135 use only IPv4, and 325 only advertise IPv6 prefixes. APNIC also publishes a report on BGP as seen there; the numbers differ a little as the BGP database seen by any given operator differs from that seen by other operators, but are generally in the same ballpark. There are many reports comparing IPv4 and IPv6 performance. A significant issue with IPv6 historically has been the use of tunnels, which often build an overlay network very different from the network underneath, and differences in routing, and have recently been commented on as a potential security risk when they cross network boundaries. Right now, at least as seen by APNIC, IPv6 seems to mostly have better performance. As IPv6 becomes more widely deployed, IPv6 routing increasingly mirrors IPv4 routing, so that the two become more similar. Facebook have described controlled A/B tests that show IPv6 to be 15% faster on average for devices on mobile networks in the US, with some devices showing even better results. Measurements using Akamai’s RUM system have also shown measurable performance improvements for IPv6 connections from US mobile networks. At the last UK IPv6 Council meeting, Sky presented measurements that show on average a slight performance benefit for IPv6 over IPv4. In 2012, the Rocky Mountain IPv6 Task Force reported that 11 (36%) of the 39 Cloud providers (and hosting services) they polled were IPv6-capable. A number of other frameworks and providers have since become IPv6-capable as well, including Cloudflare, Google, Office 365, OpenStack, Amazon Web Services (AWS), Azure, Microsoft, Digital Ocean, Hetzner, and others. For more detail about the state of IPv6 in cloud deployments, see Shannon McFarland’s presentation to the recent North American IPv6 Summit. A common question is “when will IPv6 be dominant”, which can be understood as “when is the last date by which I should think about turning it on?” Depending on the market, IPv6 is already dominant; in mobile wireless, in some networks, IPv4 is almost non-existent or being turned off, using 464XLAT to translate to IPv4 at the edge if needed. In most contexts, however, it is limited by the clients that use it; if those clients tend to be in enterprise networks, they are generally limited to IPv4 by their source network. What we do observe, however, is that when the clients have the ability to use IPv6 for their services, they readily move to using IPv6. There are at least two published data points. 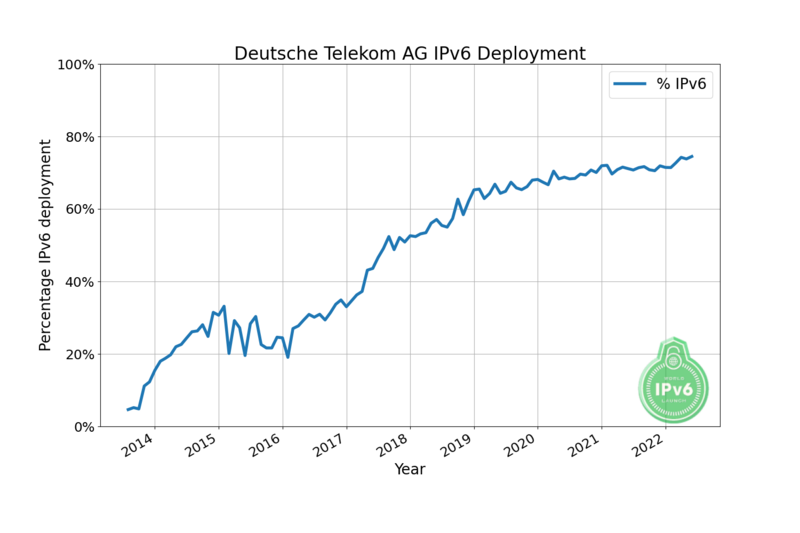 Swisscom suggests that it thinks IPv6 will exceed IPv4 in its wireline network in 2018 or 2019, and that IPv4 will become negligible by 2024. The IPv4 Market Group, which wants to maximize the value of an IPv4 address, suggests that IPv6 will be 50% of connected users by January 2019. As noted in §3.6, most backbone ISPs (those that offer transit service to corporate customers) advertise IPv6 prefixes in BGP today. Considered by country, transit ISPs offering IPv6 services exist in every country, with the exception of parts of Africa, the Middle East, and China. Comcast is actively deploying IPv6 in the US. Per the World IPv6 Launch website, Comcast has an IPv6 deployment measurement of 46%. British Sky Broadcasting has IPv6 deployment in excess of 75%. Google Fiber in the US, XS4ALL in the Netherlands and VOO in Belgium all have IPv6 deployment in excess of 60%. ATT (US) and Telenet (Belgium) have IPv6 deployment in excess of 50%. Google, LinkedIn, Akamai, Netflix, and Facebook are actively deploying IPv6 within their networks, and connecting to IPv6 users outside. An interesting point is that they report that delivering their services using IPv6 appears to improve user experience in terms of download times. LinkedIn has commented on their plans for data center operation. They observe that the same service implemented in IPv6 often results in a reduced page download time over IPv4 service. Explanations for the observation vary, but a common comment is that the IPv6 service doesn’t require the middleware, and middleware issues, that IPv4 service does. They are in the process of deploying IPv6 throughout their data centers, and plan to turn IPv4 off in 2018. This suggests a fix for the middleware implementation problem; maybe the middleware is no longer needed. Similarly, Facebook has been public about removing IPv4 from its data centers; they bring IPv4 and IPv6 to load balancers, and use IPv6 exclusively within the data center. While most are less public, and perhaps retain IPv4 in an overlay, several companies are exploring IPv6-only approaches. Redpill Linpro, in Norway and Sweden, operates as a partially IPv6-only data center, using SIIT-DC to translate external IPv4 traffic for service within the data center. The Internet of Things is difficult to report on; to begin with, many implementations don’t even use IP, but run on Bluetooth, or in industrial robotics environments, run directly on Ethernet. IPv4 is also commonly used, but has issues with address count – there are a lot of the devices. BC Hydro and the city of Salzburg have deployed ZigBee SEP 2.0 (IPv6/6LowPAN) Smart Grid networks using Cisco and Itron technology, and the Thread Group, led by Google Nest, standardizes on IPv6/6LowPAN technology. Mobile Wireless, today, is rapidly becoming an IPv6-majority market. Reliance JIO, a new player that launched commercial service in September 2016, reports that about 90% of its traffic uses IPv6, driven by its major content providers. Verizon Wireless similarly reports that about 90% of its traffic uses IPv6. T-Mobile is among the providers in the process of turning IPv4 off. Other major cellular IPv6 providers include AT&T Wireless, Sprint, Telus, Tele2, EE, KDDI, Softbank, OTE, Rogers and many others96. Enterprise operations tend to be the “elephant in the room” when it comes to IPv6 deployment; if 23% of AS’s advertise IPv6 prefixes, 77% do not, and those are likely to be enterprise networks. Cost projections come in the form of advertised hosting services (Mythic Beasts offers IPv6 addresses for free with its VPS service, but charges for IPv4) and in the IPv4 address market, where reported costs vary from $6.99 to $15.30 per address, and the value of an address is expected to start falling when IPv6 deployment passes 50%. In addition to the costs incurred in the form of network complexity, the address space itself costs money, and represents an opportunity cost if not sold. In other words, for Microsoft IT, turning on dual stack operation and then turning IPv4 off is expected to reduce cost and introduce efficiencies. It is the most sensible business alternative. Massachusetts Institute of Technology (MIT) has taken a similar step. It was originally assigned 16 million addresses as a single block. It has recently decided to sell half of that space, reportedly to Amazon, to fund its IPv6 deployment. Dropbox too have observed the strong growth of IPv6 deployment and version 24 of the Dropbox desktop client, released April 17, 2017, supports IPv6-only and dual-stack networks. Cisco have provisioned a whole building on their corporate campus with an IPv6-only corporate network and services infrastructure. Deployment hasn’t been as easy as one might hope, however. Microsoft’s internal conversion to IPv6-only networking reportedly stalled around bugs in its own products and bugs and misfeatures in vendor products. A common deployment complaint is that middleware has IPv6 as a “roadmap” feature, meaning that it may be advertised as a feature, but will be implemented only when someone offers to pay for it. Even products that implement IPv6 do so inconsistently: until very recently, Windows required implementation of DHCPv6 to the exclusion of RDNSS, while Android does the opposite, so that enterprise operators, who generally have both products in their networks, are forced to implement both. At this point, IPv4 addresses remain available, but at a cost. A detailed roundup of that market has been done by Geoff Huston, and presentations on the topic may be obtained from the IPv4 Market Group. From a certain perspective, the discussion is a cost tradeoff; maintaining an IPv4 network has costs associated with it, both in extra equipment such as Network Address Translators, which are a solution to lack of address space and as such are not needed in the IPv6 network and the cost of IPv4 address space as the network grows. As noted, the address space is itself an asset (it has value if sold or otherwise transferred), but it is a speculative asset as IPv6 deployment advances. The other side of the trade-off is the cost of an upgrade program – which might be partially paid for by extracting the value from the IPv4 address space, as MIT has done. 3.10 What are Ongoing Incentives and Challenges for IPv6 Deployment? The greatest challenge in IPv6 deployment is the common perception that IPv6 brings no additional benefit over IPv4: that apart from the larger address space, it brings no “killer application”. The reality is that the “killer application”, besides the size of the address space, is the operational simplifications that reduce the cost of operating the network and remove the complexities introduced by network address translation. For Imperial College London, their reasons for IPv6 deployment despite having adequate IPv4 space were the realization that they would eventually run out of IPv4 space and that they didn’t want to be caught out by a sudden need to deploy IPv6. The cost of a rapid deployment could be significant, whereas the gradual approach they have adopted has not been expensive and has minimized the chance of unforeseen surprises. As noted, networks worldwide are in the process of turning IPv6 on, and some are in the process of turning IPv4 off. Apple now require that all apps submitted to the App Store support IPv6-only networking. An interesting business opportunity exists, given the current IPv4 market, to deploy the technology and then sell a company’s IPv4 address space to pay for the conversion. In that regard, the IPv4 space is a speculative asset; as the conversion progresses, in all likelihood the value of an IPv4 address will decay over time. The projections of the IPv4 Market Group may or may not be exactly correct, but the outline of the graph is assuredly correct; they assert that we can expect IPv4 prices on the market to start to decline in 2019. One issue is that IPv6 deployment is not a trivial process. Wise networks have a standing purchase policy, that software and hardware they purchase is IPv6-capable at the time of purchase, so they can turn it on when they need to. Before an IPv6 deployment can happen, the network must be audited for support, and older hardware and software updated. Common experience says that this is clocked by budget cycles; the audit determines what must be updated, the budget is negotiated, and only then can deployment start. One doesn’t simply flip a network over to IPv6, especially a complex one. It is generally accomplished in pieces, and may require updating of security and other policies. The hardest part of any journey is proverbially the first step, and not taking that step merely delays the pain and the costs involved. These requirements have large overlaps, but differ in points. The RIRs each offer training in IPv6 deployment. As noted, IPv6 has been a project in development or test for a long time, but is now a present reality. To pick one country, Trinidad and Tobago use IPv6 for a significant fraction of their traffic. This demonstrates that IPv6 is not a research project or “only in the most developed countries”; Trinidad and Tobago is among what the UN calls “Small Island Developing States”, and an object of UN development funding. But Google asserts that 15% of accesses from there to Google use IPv6, and Akamai asserts that 20-30% of their traffic to Trinidad and Tobago uses IPv6. Of the G20 nations, 18 have measurable IPv6 traffic, and 12 are in the list of 37 nations using Google for more than 5% of their traffic. From an adoption perspective, IPv6 has now emerged from the “Innovators” and “Early Adoption” stages, and is moving into the “Early Majority”. The price of an IPv4 address is near its projected peak, and cloud hosting providers are starting to charge for IPv4 while leaving IPv6 free. An IT department or CIO that is faced with purchasing IPv4 addresses has reason to ask whether the expense is worth the value. The short answer is that it increasingly is not. And even not faced with that decision, the same company would do better to sell the address space it has and use the money to fund IPv6 deployment, connecting to an upstream ISP that will use NAT64 to connect to remaining IPv4-only content.